You’ve had a long eight-hour work day, and you’ve been stuck in traffic, and you’re exhausted from a red-eye flight coming home from vacation, and you just want to retreat to a comfortable sanctuary where you will fall asleep instantly. Transforming your bedroom into a dreamy oasis doesn’t have to be a costly or time-consuming project. To create your ideal bedroom, you’ll need to start of thinking about what you want in a bedroom, what style bedroom you like, and what brings you peace. We’re here to help you get started on creating a sleep haven. Arguably the most important aspect of any bedroom is the bed. As John Wildsmith said, “you are either in your bed or in your shoes, so it pays to invest in both.” When it comes to finding a mattress, it’s important to take time and test them out. Although mattresses can be expensive upfront, this is an important item to invest in because you’ll be sleeping in it every night and it will last you years. Whether you want a firm or extra cushiony mattress, there will always be a mattress for you. And don’t forget about what goes on top of the mattress. Sheets, blankets, comforters and pillows can make or break your sleeping cycle. Investing in luxury bedding can provide you with soft textured sheets and blankets that make you feel like you’re sleeping on a cloud. Once you create the perfect sleeping arrangements, you can say goodbye to groggy mornings and endless cups of coffee because you’ll wake up refreshed and ready to go. The other furniture is equally important. After deciding on the vision for your bedroom, research furniture pieces that match that theme. Having uniformity in your bedroom will make you feel organized and put together. Add nightstands on each side of the bed to create a sense of symmetry, and find a matching dresser and desk of similar colors and styles. If you’re looking to save money, give your furniture pieces, like your headboard, a fresh coat of paint. Just grab a sander and a cloth to clean off the surface and buy a soft, neutral paint to wake up your old bedroom. Adding accessories to your bedroom will turn it into a dreamy oasis in no time. Add various textures to your bedroom to make it look brand new. 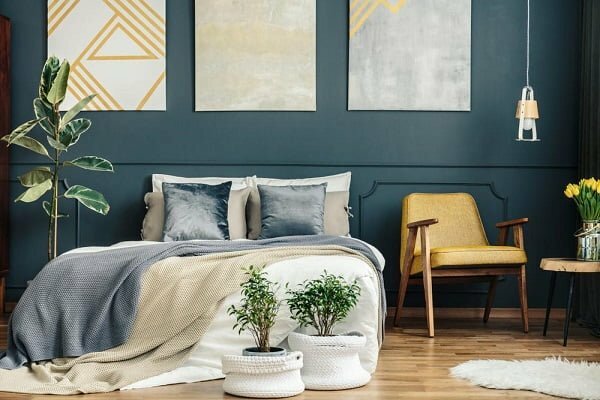 From your bedding to rugs, wood, and metal, different forms of texture and color can provide you with the bedroom presence you’re looking for. Go for light neutral browns and greens for an earthy tone, or various shades of blue to feel calm, cool, and collected. Accent pillows can add a splash of color to your bed or seating arrangements, and textured rugs can add a touch of comfort and hominess to your bedroom if you have wooden floors. Other ways to spruce up your bedroom is through nature. Line your windowsill with patterned succulents or add a floor plant next to your desk to improve the air quality in your bedroom. Finally, you can reorganize your wall art, or you can find new pieces to hang up and bring a sense of life to your sleeping oasis. You don’t want to fall asleep surrounded by clutter that will haunt your dreams and keep you up at night. If you have a TV in your room, turn on Tidying Up with Marie Kondo and organize your room and your life. Learning ways to declutter your room can bring a sense of peace to your life. Simplify your way of living by letting go of unused items and clothes and create storage spaces in your closet and under your bed to hide your things and keep your room clean and free. You can modernize your room by adding sleek pieces of technology that will make you never want to leave your room. Play white noise or calming ocean sounds through a Bluetooth speaker, or ask your virtual assistant what the weather is going to be like so you know what to wear for work in the morning. You can even turn your room into any landscape you want, from oceans to a deep forest, with a home projector. Turning your bedroom into a dreamy oasis doesn’t have to be an arduous task. Make it fun! You’ll be spending every night in here, so take the time to make the place your own and add features that will make you feel cozy and relaxed.